Actor Keanu Reeves is covering his mouth here while he is laughing. While in some cultures it is considered proper etiquette to do this, such as women in Japan, in the vast majority of the world this is a sign of embarrassment. 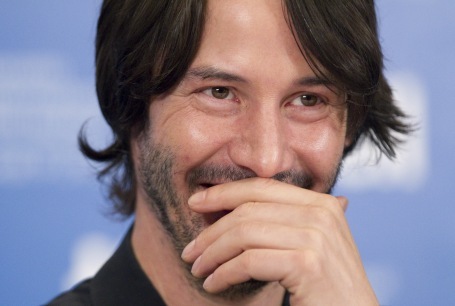 Although Mr. Reeves obviously finds something funny - part of his psyche does not want to fully and openly express it.